I love the look of the cute paper straws as much as the next person, but I have to be honest and tell you I don't love drinking out of a paper straw. Sort of makes me feel like someone forgot to take the wrapper off. 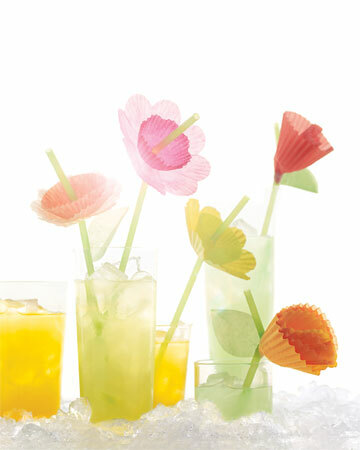 So I love that these cute floral straws from Martha use regular run of the mill plastic bendy straws. And they also make good use of cupcake liners too. You can check out the tutorial to create your own flower straws HERE. I'm with you on the paper straws..pretty but not great to actually use! I love this idea - cute & an easy way to coordinate to any theme!